No one who eats this will notice (or care) that our Shortcut Chicken Parmesan only took you 30 minutes to put together. All you'll hear is applause. Place chicken in 8-inch square baking dish; top with tomatoes and cheese. Bake 25 min. or until chicken is heated through and cheese is melted. Meanwhile, cook pasta as directed on package. Drain pasta. Serve topped with chicken. Coat 4 boneless skinless chicken breasts (1 lb.) with 1/2 pouch (1/4 of 6-oz. pkg.) SHAKE 'N BAKE Original Coating Mix. Bake as directed on package. Assemble recipe as directed. Reduce baking time to 15 min. 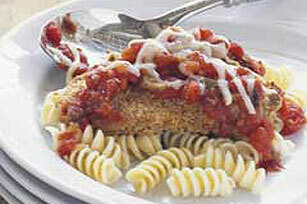 Try our Healthy Living version of Shortcut Chicken Parmesan. Substitute your family's favorite pasta for the rotini.